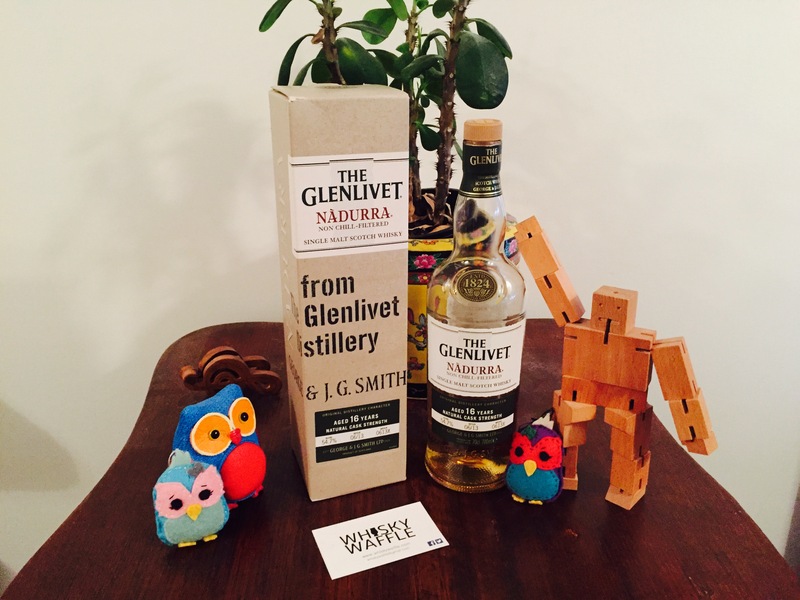 We are quite fond of The Glenlivet. The 12yo is a dependable drop that hits straight down the middle, perfect for when you just want to sit back and have a dram (although the introduction of the Founders Reserve may change all that). So what happens if you knock things up a notch? If you think that your glass of Glenlivet needs a bit more punch, then look no further than the Nàdurra. Gaelic for ‘natural’, the Nàdurra is a cask strength release from the Speyside distiller. Glenlivet claims that it is a traditional 19th century style dram, evoking the character of the whiskies originally created by founder George Smith. Using first-fill American oak casks, the Nàdurra is aged for 16 years and then bottled between 54-55%. My particular example stands at 54.7% and was bottled 06/13 from batch 0613X. As you would expect from a bourbon-aged whisky, the colour is fairly light, although the strength keeps it at a weak amber rather than straw-like. The nose is fat and rounded, with melted brown sugar, vanilla, cinnamon, cloves, cocoa, peach, malt biscuits and apricot jam. It’s fairly direct on the nostrils too thanks to the strength, but the sweet, gooey nature means that it oozes seductively, like the smell of pudding wafting from the kitchen on a cold night. On the mouth the Nàdurra is hot and slightly dry, with a nice spiciness. When you take a sip it zooms straight to the roof of the mouth before plonking down onto the back of the tongue. A bitter caramel finish lingers around the mouth, although I suspect it would be rather shorter at a lower strength. The Glenlivet Nàdurra is no everyday dram to knock back after work. Instead it’s perfect for snuggling down on the couch at the end of the evening, or, and I speak from personal experience, keeping warm while gazing up at the stars on a perfectly clear night. If you’re looking for a friendly companion cask-strength dram, then the Nàdurra is a natural choice. Aye, it sure is. I’m really keen to try the olorosso cask (actually, Nick tells me I may have already done so, but it was at whisky live, so the memory is a little fuzzy haha).